Join Marietta Main Street downtown this weekend for First Friday: Share the Love from 5:00 p.m. to 9:00 p.m.! Residents and visitors that brave the chilly weather will be rewarded with late night shopping, special promotions and in-store specials, and opportunities to share their love for Marietta. While February celebrates romantic love, this First Friday celebrates all kinds of love – love for one’s community, neighbors, friends, and family. 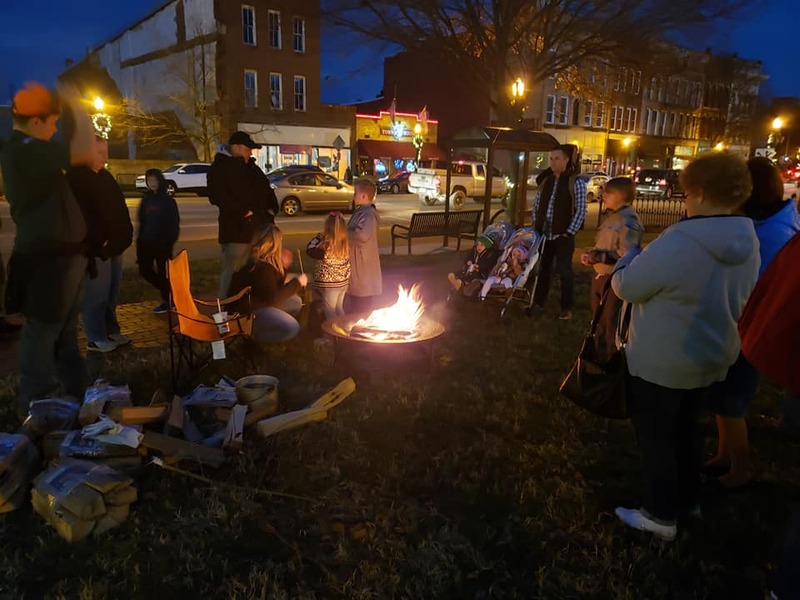 The Venturing Crew will once again be set up on the Armory Lawn serving up s’mores kits for $2 each for shoppers who want to make their own s’more. The group will also be collecting non-perishable items for local food pantries. Items requested include Mac & Cheese, tuna, pancake mix, instant potatoes, cereal, spaghetti, rice, canned soup, toilet paper, ramen noodles, flour, sugar, canned vegetables, baby food and diapers. Shoppers can drop off donated items to the Venturing Crew at the Armory, or collection points at Wit & Whimzy, Marietta Dance Academy and Threadz. The food drive was inspired by a drive hosted by local resident Marjorie Clayman, which took place throughout the month of January. Friday’s festivities also include the kick off of Enrich Marietta’s engagement events at both the Marietta Brewing Company and Jeremiah’s Coffee House. Enrich Marietta is a process to create a community-led plan for the future of Downtown Marietta. The Marietta Downtown Plan will be a comprehensive plan of policies and projects to guide revitalization and development within Downtown over the next 5 to 15 years. Join members of the Enrich Marietta steering committee during First Friday at either location to learn more about the process and participate in interactive activities. First Fridays are monthly events that showcase the best of Marietta and allow the community to take advantage of extended shopping hours. In addition to engagement activities and those taking place on the Armory Lawn, the Riverside Artists Gallery is hosting a special Share the Love event with artists Jeremy Keller, Mary Ennis, Janet Gustafson and Dave Gustafson. There will also be live music at the Marietta Wine Cellars, The Adelphia Music Hall, and Emmanuel’s Bakery.